Wedged between mega-countries China and Japan, petite Korea still manages to retain its own culture, philosophy, and, most importantly for our purposes, cuisine. Korean food is distinctive and delicious and for these reasons and more, it is catching on as a hot culinary trend. 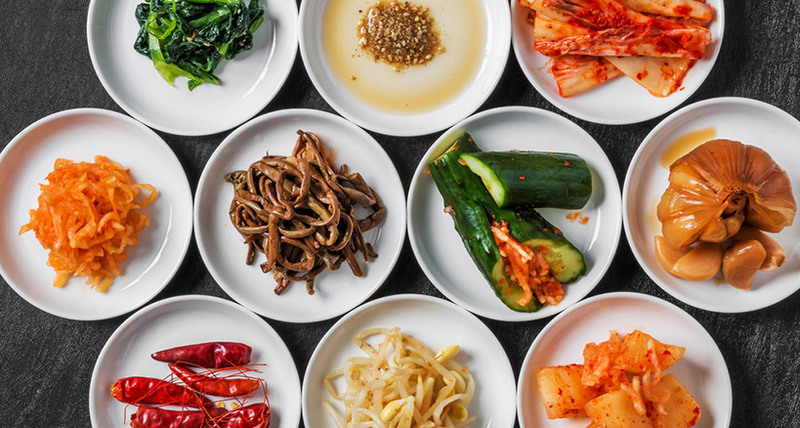 So, to get prepared for requests for Korean cuisine, read on and learn all about what makes it special and how you can offer it to your customers. The Korean Peninsula is a peninsula that extends south from China into the ocean alongside Japan, and it is surrounded by the Sea of Japan and the East China Sea. Until World War II, Korea was a single country; after the Second World War, however, Korea was divided in half to form the Democratic People’s Republic of Korea (known as North Korea) and the Democratic Republic of Korea (known as South Korea). South Korea has fertile plains suitable for agriculture in its southern region, and the country can grow enough rice there to support its population. The main rivers, the Han and the Kum, help to provide adequate water supply for the agricultural lands and, for centuries, the Koreans have eaten the products of the land and sea. They began growing grains thousands of years ago, and rice cultivation was introduced to some parts of the country around 2000 BC. During this time they also grew millet, soybeans, red beans, and other grains. Korean cuisine has evolved over the years with influences from a variety of cultures; the country’s geography; and the agricultural and nomadic traditions of the people of the Korean peninsula. In addition, Chinese and Japanese invasions over the course of hundreds of years gave rise to a culinary influence on Korea that still retains its impact today. Like the Chinese and Japanese, Koreans eat rice with almost every meal and use chopsticks. Also common is food that is cut up into little pieces; that is easy to pick up; and that can cook quickly–which cuts down on the use of fuel. Note: Most of the food described here comes from South Korea, although the same food is probably enjoyed by North Koreans, as well as people of Korean descent living anywhere in the world. Korean food is synonymous with healthy and delicious. Korean cuisine shares many similarities with other Asian cuisines, such as the importance of rice and vegetables in all dishes, and cooking methods such as stir-frying, steaming, and braising. Koreans, like most people in Asia, eat less meat than people in the Western world. Red meat is expensive, so it is usually saved for special occasions, and chicken or fish is more commonly eaten. Generally, the Korean diet uses grains and vegetables, fiber from legumes – such as bean curd, bean sprouts, bean paste, etc. – and some meat. Korean food is overall low in calories and fat; although it can be on the sweet side, the most distinguishing feature of Korean food is the spiciness. Red pepper paste, green onion, soy sauce, bean paste, garlic, and ginger are just some of the many seasonings Koreans use to flavor their dishes, and they are combined in ways that enhance the flavor. The food is served with a plain grain such as rice to cool the heat of the spices. Kimchi (pronounced kim-chee) is a well-known vegetable dish which is highly seasoned and served with every Korean meal. It is said to stimulate the appetite and is considered to have many health benefits. The main ingredients are cabbage and radish, which are fermented with red chilies, salt, and other vegetables. Health professionals say it’s the fermentation process that makes kimchi a super food. 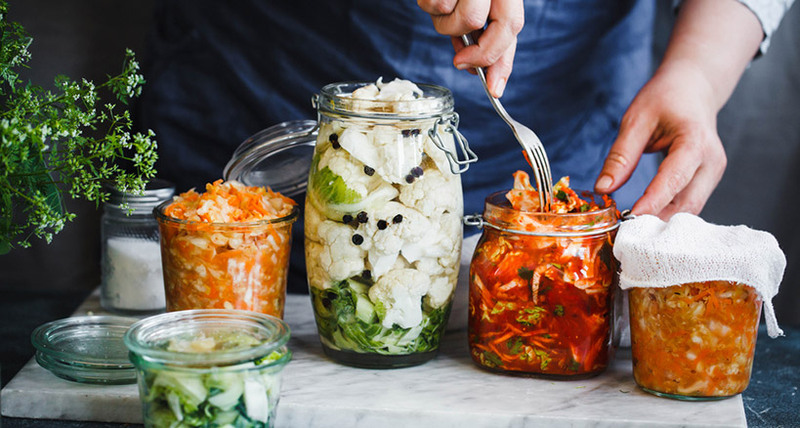 Fermentation boosts nutrients and imparts beneficial microbes that can make us feel better. Kimchi is also packed with vitamins and minerals that can help your heart and possibly your mental health. Place cabbage in a large bowl and sprinkle with salt. Mix thoroughly and allow cabbage to sit for 1-2 hours until wilted and water has been released. Discard water after 1-2 hours. Rinse the cabbage 2-3 times in the sink until salt is removed and drain in a colander for another 15-20 minutes. Combine cabbage with remaining ingredients and mix. Once combined, place mixture in a jar, pressing down and packing tightly so that the mixture is submerged in its own liquid. Cover jar and allow to sit at room temperature for 2-5 days. Place jar on a plate since the mixture may bubble over while fermenting. Every day during the fermentation process, remove the lid to release gases and press down on the mixture to keep it submerged. You can taste a sample each day to decide if the level of fermentation is to your liking. Koreans also like meat dishes, and pulgoki is one of the best known. 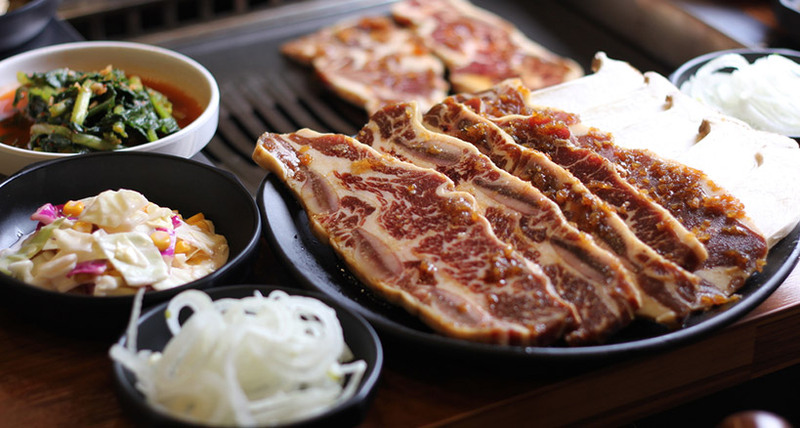 Pulgoki literary means “fire beef,” but it is generally called “Korean barbecue.” The meat is marinated in a sauce made with soy sauce, garlic, sugar, sesame oil and other seasonings and cooked over a fire – often right in front of the guests. Try this great recipe and wow your clientele. In a large re-sealable plastic bag, combine beef with garlic, pear, green onions, soy sauce, sugar, sesame oil, rice wine, sesame seeds, fresh ginger, and ground black pepper. Seal, and refrigerate for 2 to 3 hours. Preheat the oven’s broiler and set the oven rack about 6 inches from the heat source. Brush oil over grill pan. Place beef on pan. Cook, turning to brown evenly, for 3 to 6 minutes, or until done. In Korea, a meal served for a group of people often includes several large main dishes and as many as 20 side dishes (banchan). 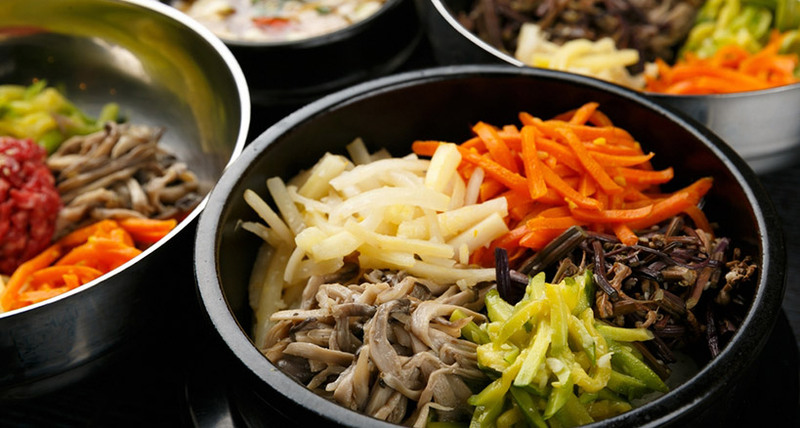 Unlike other Asian cuisines, Korean cuisine includes many uncooked vegetables served as salads and pickles. Traditional Korean meals also include soup, such as kamja guk (potato soup), served hot or cold depending on the season. Other common dishes include kalbi (marinated short ribs) and sinsollo, an all-in-one meal consisting of meat, fish, vegetables, eggs, nuts, and bean curd cooked together in broth. Sinsollo is also a type of Korean cooking pot that is like a large brass bowl with a tube in the middle. White charcoal, which creates a smokeless fire, is put in the tube to provide cooking heat. Korean cooks try to include five colors at every meal: red, green, yellow, white, and black, to represent the earth’s five elements. Koreans seldom serve dessert, but often eat fresh fruit instead. Meals are considered an important event in the day, worthy of extensive prep time, and it is considered impolite to talk while eating. Traditionally, the dishes of food are placed in the middle of the table and individual bowls of rice are set in front of each person. To create Korean cuisine that is as genuine as possible, remember to make it hot and spicy. One of the most important ingredients is gochujang (fermented red chili paste). Onions, garlic, scallions, ginger, sesame oil, doenjang (fermented soybean paste) and powdered red pepper are other popular spices. The Korean belief of yin and yang is reflected in the food as well, which is nutritionally balanced in terms of colors, textures and flavors. Koreans also believe that food has medicinal value, and herbs, such as ginseng, mushrooms like reishi and berries such as wolfberry, are often used in their cooking, along with lots of vegetables and different types of wild greens. Ingredients like dried persimmon, red dates (jujube), pine seeds, chestnut, and tangerine are used in Korean cooking and also in specially brewed teas, with which a Korean meal usually ends. You don’t have to hail from Korea to give your customers and their guests great Korean food. Use the Internet to find recipes for loads of Korean-style side dishes and you’ll be well on your way to preparing the perfect Korean meal. Prepare a big batch of kimchi in advance and serve it in abundance. Once you bring out your Korean specialties your guests will be enchanted and your Korean meal will be a huge hit.